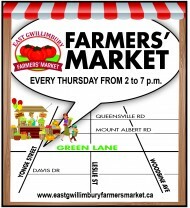 Join us at the East Gwillimbury Farmers’ Market, every Thursday from 2:00 pm to 7:00 pm Enjoy local fruits, vegetables, perennial, eggs, meats, cheeses, baked goods, honey, sauces, preserves, soaps, artisans and much more while supporting our local businesses. Find us at Market Square located in the Fieldgate Plaza, Yonge St. and Greenlane More vendors, more variety something for everyone! Located at the intersection of Yonge St. and Greenlane in the Fieldgate Plaza. The Market is located at Market Square in front of Lone Star Restaurant and RBC .